Osteosynthesis - operation connection of fragments of bones with the help of special fixing products, used for treatment of fractures and different kinds of orthopedic surgery. The most widespread application as a method of treatment of bone fractures and false joints. When osteosynthesis eliminated displacement of bone fragments and provides solid fixation in the correct position, creates the most favorable conditions for the formation of callus, improve anatomical and functional results of treatment and decrease its timing and duration of disability. Indications for osteosynthesis of fractures can be absolute and relative. Absolutely shown osteosynthesis of fractures of the knee, olecranon, some of the femoral neck fractures with the displacement of bone fragments, fractures with significant and permanent displacement of bone fragments, interposition of soft tissues, the threat of damage to large vessels and nerves. Relative indications for osteosynthesis is the need of shortening of terms of treatment, elimination of insignificant displacement of bone fragments. Osteosynthesis and is shown in open fractures after appropriate surgical treatment of wounds of soft tissues. Contraindications to the osteosynthesis: severe General condition of the patient, shock, active tuberculosis, acute infectious diseases, chronic diseases of cardiovascular system and respiratory organs. The operation of osteosynthesis can be performed under General or local anesthesia. Fig. 1. Cerclage of fragments of the leg in an oblique spiral fracture. Fig. 2. Osteosynthesis plate Lena at fracture of leg bones. Fig. 3. Intraosseous fixation hips metal rod. Fig. 4. Osteosynthesis the neck of the femur three-nail. For osteosynthesis using metal (nails, plates, screws - see Orthopedic tools and plastic retainers, silk, catgut, and other materials, as well as bone grafting (see). Metal structures for osteosynthesis shall be made of steel of special stamps; they can for a long time to be in the tissues, without adversely affecting them and not exposed to corrosion. By way of fastening of fragments distinguish the following types of osteosynthesis. 1. Cerclage (blanket stitch, Fig. 1) is achieved by means of wire or metal tape (Serleena tape). 2. Bone bead - is done by conducting thread or wire through bone channels, drilled in fragments, for their rapprochement to the contact. 3. Osteosynthesis by screws, bolts and metal plates Lena. Screws, bolts performed across the bones perpendicular to its axis, through both the fragment. Metal plates are placed on the surface of the bone, they serve as an additional outer "bus" (Fig. 2). 4. Osteosynthesis metal beams. One facet of a beam is carried out in medullar channel, the other features on the surface of the bone. 5. Intraosseous fixation of fractures with metal rods or bone pins. They are introduced in the medullar channel both of fragments, i.e. they serve internal "tire". Osteosynthesis can be made public method with the operational exposure ends of fragments or closed by (introduction of the rod in the medullar channel without opening the fracture site). The choice of method of osteosynthesis depends on the location and nature of the fracture. With diaphyseal fractures of long tubular bone (femur, the bone of the forearm, collarbone, and others), the most widespread intraosseous fixing metal rod (nails of Kundera, Dubrova, CITO, Bogdanova). When intraosseous fixation hips (Fig. 3) a plaster cast not impose the burden of the limb is allowed within 1 month. after the operation, the capacity for work is restored after 3 months. When intraosseous the bones of the forearm and leg necessary additional immobilization plaster cast. Its duration depends on the type of fracture, the time of production operations, but the average is 2 to 3 months. in fractures of the tibia and 2 months. fractures of the forearm. Fractures of the femoral bone osteosynthesis of fragments produced three nails (Fig. 4) using various devices (devices Petrov - Nenova, Kaplan, guides spokes and others). Additional plaster immobilization is not required. The operation is done mostly elderly patients and almost only it allows to achieve seam fracture. Osteosynthesis facilitates the care, prevents pneumonia, pressure ulcers , and so on, the accretion of the impacted fracture of the femur is in 6-8 months, at the same time allowed the full load on a limb. For osteosynthesis of fractures of the bones of the lower leg being used more and more, different plate, bolts. Using a metal bolt restore articular surface of tibia when intra-articular fractures of the condyles, the divergence " fork" of the ankle joint. With broken ankles use the fixation of metal screw. Tabs used for osteosynthesis, after full fusion of fracture, radiographically confirmed, must be removed. With the exception of three nails entered fractures of the femur. They should be removed only for special reasons (infection, infiltration nail in the joint and others). Excessively long stay latch undesirable, and in some cases dangerous (infection, disturbance of trophism bones, complexity late extraction). Indication for immediate extraction of holding structures during non-consolidation of a fracture is the development of purulent processes in the field of fracture (with fixing plates and belts), broken and the offset catch and other complications. Patients care after osteosynthesis little different from the usual care operated. Special attention should be paid to the state of the bandage on the wound, the correct position of the operated extremity. Osteosynthesis (from the Greek. osteon - bone and synthesis connection) - rapid connection associated bone fragments and solid fixation of them using various materials. Osteosynthesis when used as fresh, and when the old (wrong accrete, dead) fractures, pseudoarthrosis, after osteotomies and reconstructive operations on the bones. 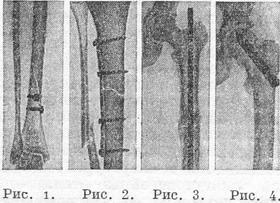 In the late 19th - early 20th century were offered ways of Acting by means of wires, screws, plates, some kinds of external and nekotnei fixation of fractures. Cancer (G. Kuntscher) elaborated methods and techniques of intraosseous fixation of fractures with a long steel nails, introduced in the medullar channel and firmly holding bone fragments. Later intraosseous fixation of fractures suggested various pins, rods, nails, probes, and to maintain bone fragments by nekotorogo (extramedullary) or external O. - various plates, beams, screws, bolts. As a material for osteosynthesis used different alloys, corrosion-resistant, such as Vitallium - alloy consisting of 65% of cobalt, 30% chromium, 5% molybdenum; now often used stainless steel and some synthetic biologically inert materials. In surgical practice, in some cases, apply and bone materials pins, plates from auto-, Homo - or heterogeneous bones. Processing method Homo - and heterogeneous bone material freezing allows to use them, for example the substitution of large bone defects. Indications for Acting can be absolute and relative. O. absolutely shown in fractures with the interposition of the soft tissues between the fragments, fractures with damage to blood vessels, nerves, correctly fused with the shortening and sharp infringement of function of a limb, with false joints; absolutely O. shown in fractures of the knee, her hips, olecranon with the expressed displacement of bone fragments, as well as many fractures that violate the form limbs and function of joints (elbow, knee, ankle). Relative indications for osteosynthesis are broken collarbone with displacement of bone fragments, the neck of the femur in children, improperly healed fractures of the tibia with angular displacement and violation of the axis. Acting can be applied at a fresh open fractures with careful debridement soft tissue and the bone fragments. The successful outcome of the Acting facilitate: the provision of special equipment, high technology of the surgeon, strict aceptic operations, use of antibiotics. Contraindications to the osteosynthesis: overall condition, shock, diabetes, active tuberculosis, severe chronic diseases of the respiratory and cardiovascular systems, inflammatory condition of the skin, soft tissues and bones in the field of fracture, acute infectious diseases. Fresh gunshot fractures in the field atmosphere may be subject Acting in absolute condition after radical primary surgical treatment of musculoskeletal wounds, systematic introduction of antibiotics and the possibility of direct observation of the wounded during the first 5-6 days after the operation. To successfully complete the operation, you should select the proper way of anesthesia, to have a clear radiographs in two projections, to use the most convenient and least traumatic access, to find necessary material and equipment - both General and special operations on the bones. The simplest form of O. - bone seam, linking fragments by stainless steel wire, two or four stitches which tighten special tongs and spin for a dense contact of fragments (Fig. 1, 1 and 2). This kind of osteosynthesis is normally used for oblique fractures with a large surface of fracture. However, such a way, especially when using a thin wire of round cross-section, may cause harmful atrophic changes in fragments, compressed wire. The last to be deleted when more or less pronounced consolidation of a fracture in 2-3 months after the operation. It is better to use not round, and plate wire. Bead wire is used sometimes when intra-articular or periarticular fractures of the olecranon (Fig. 2), in fractures of the condyles or Razmyslov shoulder, at dislocations in acrobaleno-clavicle joint fractures of the knee (Fig. 3). Fig. 1. Linking fragments wire 1 - ligature bones wire; 2 - ligature of the bones tape Putti - Parama. Fig. 2. Bone seam at the turn of the olecranon. Fig. 3. Blanket stitch when the fracture of the knee. Fig. 4. Metal brackets for osteosynthesis at reconstructive operations: 1 - Moore - blunt; 2 - Revenko. Fig. 5. Extractor with three-bladed nail. Depending on localization of the fracture is necessary to resort to more complex methods of osteosynthesis. Fractures and pseudoarthrosis cervical hip produce knocking together fragments of three-bladed nail Smith-Petersen channel inside for a guide spokes (extractor nail - see Fig. 5). With success can be applied ductless nail Petrov - ASNOVA that is administered using the sender. At reconstructive operations on the occasion of the defects of the head and neck of the femur, coxa vara, congenital and pathological fractures required to keep introduced in the joint cavity fragment to fusion. Most suitable for this purpose metal brackets Moore-blunt and T. A. Revenko (Fig. 4.1 and 2). The latter consists of two connecting parts, making it easier to remove it. Depending on the form of the femur fractures are using a variety of Acting At cross comminuted fractures used intramedullary Osteosynthesis (Fig. 7); with oblique fractures offset add external fixation of bone fragments strclassname seams - tapes of plate steel wire (Fig. 6). Fig. 6. Combined osteosynthesis hip fracture: intramedullary metal rod and cerclage seams. Fig. 7. Intramedullary osteosynthesis with a metal nail Dubrova. Fig. 8. Combined osteosynthesis: metal rod and bone graft. Fig. 9. Screwing broken condyles of the femur to the bone bed. Fig. 10. Osteosynthesis with a metal screw at fracture of the tibia and the rod in fibula: 1 - front projection; 2 - side projection. For stimulation of regenerative processes, especially when pseudoarthrosis, after O. rod in place of the fracture improve bone graft (Fig. 8). Fractures of the condyles of the femur, T and V-shaped, with a significant shift, beyond the bloodless mapping, subject surgical treatment by screwed fragments to the bone bed (Fig. 9). Osteosynthesis screws used in fractures of the tibial condyles, and when Doladugina fractures of the tibia (Fig. 10, 1 and 2). When the transverse fractures diaphysis Shin appropriate to apply intramedullary O. rods of Kundera, and with oblique-plates and beams K. M. Klimov, rings plate wire. In all cases, lower transaction completes the imposition of deaf plaster bandage for a period of 1.5-2 months in order to avoid loosening of fragments, bend or even break of the stem. Injection technique metal rod of Kundera in fractures of the hip is the following. Section prednamerennoe side of the hip, on the projection line connecting spina iliaca ant. sup. from the outer side of the knee. Revealing the location of the fracture, raise the proximal end of the fragment of the hip, enter a metal rod in his channel in a retrograde direction, eye forward, a rare but aggressive hammer drive in a nail. End out about the big spit outside the bones. Over the place of exit nail cut through the soft tissue and, having for the end of the shaft impactor, hammer hammer rod in the opposite direction. When the end of the rod on the surface of a break mobilize distal fragments, precisely match it with proximal and medullar canal his introduce the rod to a depth sufficient to solid fixation of fractures (to the distal end of the rod lies in the spongy tissue of the lower metaepiphysis hips). At fracture of the tibia metal rod Kundera enter through the proximal fragments, through the top mutatis tibia by drilling it oblique channel, penetrating into the bone marrow cavity. Fracture of the clavicle, metacarpal or metatarsal bones, and phalanges with significant displacement can fasten fragments spoke Kirchner, the free end of which output for later retrieval when the Union of fractures. Fractures of the shoulder blades with a large displacement is expedient osteosynthesis metal plate with screws (Fig. 11). Fig. 11. Osteosynthesis at the turn of vanes a metal plate with screws. Fig. 12. Osteoplastic the knee joint arthrodesis in Novachenko (1-3 stages of the operation). Treatment of diaphyseal fractures of the shoulder by O. spend as at the hip. Use the same terminals, but smaller length and thickness (F. R. Bogdanov, Kundera), twisted wire. The rods are usually injected with the distal end of the shoulder, on the back, above the elbow pit (fossa olecrani) humerus through oblique channel, drilled in it and is connected with the bone marrow cavity. Fragments can be connected and beam K. M. Klimov. The proximity of the radial nerve requires special care during surgery on the shoulder bone. Fractures of the head arm offset or twisted her arm to knock short nails, screws, bone pins and other Dispersed fragments condyles shoulder connect using bone seam or screws. Diaphyseal fractures of the forearm with the displacement of bone fragments treat a method intramedullary osteosynthesis special thin metal rods, which are injected into the bone channel radial bone of distal fragment of the beam, and ulna, on the contrary, from the top down, from the side of the olecranon. Recently spreading compression method Acting, which consists in bringing together the bone fragments under pressure caused by special metal constructions, A. AU, O. N. The Gudushauri and others). operations: the knee joint arthrodesis in N. P. Novachenko (Fig. 12); O. when gemoblastozami transplant poluustav for fastening of transplant from the diaphysis thigh after resection by A. A. Korzh (Fig. 13); O. "Russian castle" (Fig. 14); osteoplastic intra-extramedullary Acting on C. D. Caslino (Fig. 15). Fig. 13. Osteosynthesis of homogeneous poluustav the upper thigh: 1 and 2 - preparation of the transplant; 3 connection of the diaphysis hips. Fig. 14. Scheme of osteosynthesis by the type of "Russian castle". Fig. 15. Osteosynthesis bone graft on Chalino. Solidification of fractures in such cases, as a rule, completes the imposition of plaster bandages in the required timeframe. It should be borne in mind that when intraosseous the introduction of a nail in humerus distal fragments often slips from the nail under the action of gravity of the forearm. Avoid slipping fragments used screw nails or impose a plaster bandage. In the inept performance of osteosynthesis possible errors: 1) conducting rods at the insufficient depth, which does not ensure a good fixation of bone fragments; 2) inadequate reposition fracture with rotation peripheral fragment in the parties; 3) the penetration of the end of the rod in the joints; 4) damage to large vessels and nerves; 5) diastase between bone fragments; 6) big trauma of tissues and wound infection; 7) application of restraints that do not provide strong fastening of fracture.